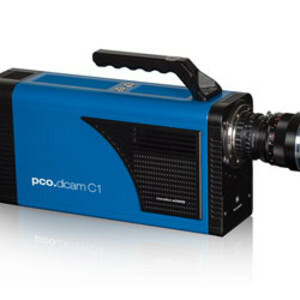 PCO has released the pco.dicam C1, said to be the first camera to combine a high-resolution 25 mm image intensifier with a 16-bit (4.2 MP) sCMOS sensor via an ultra-efficient tandem lens. The product delivers enhanced extinction ratio gating and has the ability to detect individual photons at the short exposure times of 3 ns–1 s.
The pco dicam C1 camera has the capacity to achieve 104 fps at full resolution (2048 x 2048 pixels) while ensuring an ultralow readout noise of 1.1 e- (said to be the lowest readout noise of any gated intensified camera system). It incorporates a high-speed tandem lens to deliver high-quality images with high transmission efficiency. Camera Link HS ensures uncompressed and secure data transfer. The latest standard of high-performance data interfaces enables the bridging of long distances via fibre-optic cable. F-mount, C-mount or EF-mount with lens control is available. The camera has a host of different applications in the fields of life science and industrial science, including laser-induced incandescence (LII) shock wave physics, laser-induced breakdown spectroscopy (LIBS), particle image velocimetry (PIV), time-resolved spectroscopy, plasma physics, laser-induced fluorescence (LIF), ballistics and combustion. 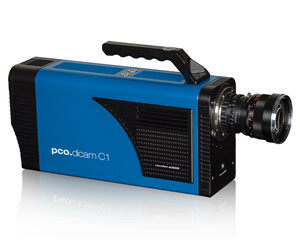 I am interested in PCO pco.dicam C1 intensified 16-bit sCMOS camera .